We are all on a journey! but it does take two! Throughout this new stage of my life I have needed people to really hear me when I have been struggling with how to move forward. From my own experiences, in this new strange way of living, those people interested in what was really happening for me have helped me to take a step at a time. There have not been too many of them! In a more isolated working environment I have needed to connect with people and learn to talk in a different way to people met along the way. If not loneliness, lack of motivation and low mood are just around the corner! This is the reality for many home workers and finding new ways to network in our home and work environment can be an increasing challenge. Really listening to people, on the phone, on the dog walk and understanding how life is for them helps to keep your own concerns in check. I love sunshine falling on the dancing daffodils. They bring such freshness and hope for the warmer weather. This has a boosting affect on mood and sense of well being. Not always of course, but their blooming does signify spring time and renewal. Time to clear out the old and bring in freshness – spring clean! Not only physically, but mentally too. What changes do you wish to make for this summer? Any old habits getting you down? Stuck in patterns which stop you from achieving what you would like from life? Time to start thinking about feeling good and looking good, so you can enjoy getting out and about in the summer!! Now is a great time for growth! Try new things? A session with a coach or hypnotherapist can help you set your intention, look at how you live your life now and find the small steps that will put you on a different path. Want to try something new and make a change? Contact me to discuss? Hoping for some more days like this! We’ve had a few sunny days, but it’s not long after the snow and the changeable weather often brings a chilly wind. Its tempting not to venture far from your hopefully warm and cosy home. To boost well being its always good to get out and about. As a dog owner or befriender you can wrap up warmly and get out there, as they insist on this several times a day!! Explore with children the parks, woodlands or public footpaths and observe the bursting buds of bushes, trees and plants or of new animal life. Help them to learn about the wonders of our nature and countryside. The garden is always beckoning at this time of year so small jobs to clear, tidy and prepare for the bursting forth of plants and vegetables, during any clear spells, helps to boost positive feelings. Plan the garden of the summer! With an improving picture, planning to meet friends and family for gatherings out and about in new places or old haunts. Helps with reconnecting after the winter hibernation. Lighter nights,with the clocks going forward this weekend, ensures more daylight and opportunities to attend all kinds of social events. Consider taking up an activity in the evening of these lighter nights. Get out on your bike, join a club or find an exercise buddy? Keeping active to improve your health. Community events are planned in parks, villages, halls and the countryside which engage people with all kinds of skills and entertainment. This brings a sense of hope and interest. Opportunities to connect in many different ways, socialise and have fun are more abundant. Volunteering time and skills to benefit your local community, gives the volunteer a sense of well being too. Skills may involve working in buildings to offer services for individuals or organisations, connecting with others and may involve activities outdoors too. A great benefit of this work for the individual is the sense of contribution and involvement locally, which can boost powerful positive feelings. So it all looks good! Certainly it is an improving picture. All activity and connecting with nature is good for our body and minds, so it is great to be able to plan more of both of these into the coming weeks. What about those niggling health and well being issues, which need some small shifts for you to be able to engage in these opportunities? Wherever you are, I hope you can get planning and enjoy some sunny, warmer moments in the coming weeks. The snow has melted and the sun is shining. Getting out and about seems much more appealing. As I was driving down a country lane and had to stop to let cars go past, I had an inquisitive face appear at my window. Hello!! How can I help? This horse was wanting to connect with me. After several days snow bound he was happy to see a human being. He stuck his head over the gate and right up to my window. What a beautiful sight! That wanting to connect is often a main driver for people. As social animals we can struggle if we become isolated. Health issues, mood challenges and fears can limit us from from achieving our potential and feel positive in our lives. I noticed in the snow an excitement from people as they trudged through the powder, feeling the different sensations in their boots, wrapped up but battling the cold. A great sense of being alive!! Smiles and and greetings were frequent. Was it the exhilaration of walking out in the snow and that connection to nature? Or was it the fear of being disconnected from others with the roads blocked, a pause in work days interrupting social interaction? Battling through the snow is not dis similar to facing any life challenge. Often people seek support with an issue because they feel isolated and unable to make progress through the connections they know. Making a change can be an exciting journey! Seeing a therapist allows discussion with a person outside of their immediate social circle, enabling them to explore issues at their own pace and without fear of judgement. The challenges of the festive season? Christmas bring lots of expectations of ourselves and others, to have a good time and for everything to be christmas advert perfect! With family members absent, or living away, financial constraints, seperated parents, relationship challenges, physical illness and mental health issues, let alone the family dynamics when getting together, the reality can be very different. So prepare for the onslaught to keep yourself positive through this holiday period. Help others or ask for support as this may prevent you from feeling too fraught. Have the food menu and present list organised well in advance, if you are hosting. Liaise with the other attendees for ideas to contribute to the smooth running of the celebration days. Or ask what your host would like you to bring, prepare or contribute if you are lucky enough to be sharing with others, so you feel involved too. Keep things simple – focus on what is important – spending some quality time with family and friends in convivial surroundings. Ask someone you know is alone at Christmas to share some celebration with your group. Volunteer some time or money for the charities supporting the most vulnerable at this time of year. Giving to others will boost your sense of well being. For many people it is possible to pace and plan for the festive season, but for some the additional challenges at Christmas time make this much more difficult. Mental illnesses such as anxiety or health issues worsened by overeating and excessive drinking can be difficult to manage during the festivities. Consider how you would ideally like to be, despite these challenges, if you functioned at your best? Again planning beforehand can be useful. To access resources which could help you to manage these feelings and anxieties in the coming weeks, input from a Coach or Hypnotherapist can be beneficial for developing new techniques. Strategies which support you to access your inner resources at crucial moments. Have a positive a festive period! 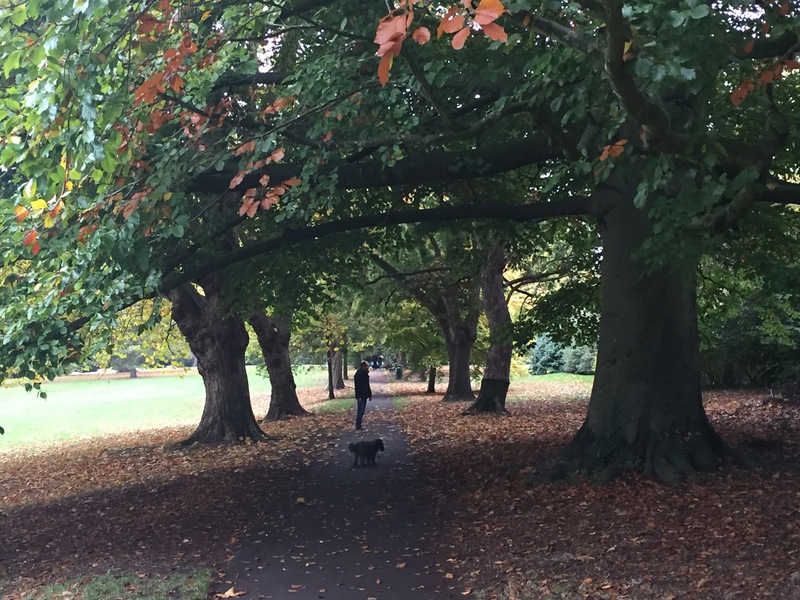 Autumn mists – leaves & little dog….get out there! The weather has turned, it’s cool & misty. The leaves are still on the trees & falling..
Before the weather gets too miserable – get out there!! Walk with friends, children and little dogs!?! 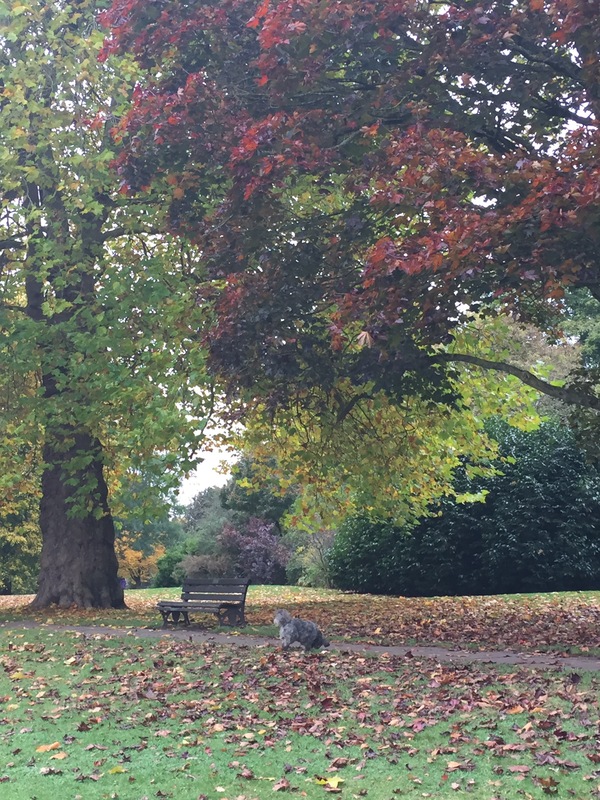 A sense of wellbeing – calm and tranquility as you observe the autumn colours, smell the changes in the season, kick the leaves and enjoy the sensation and the rustle. Great for body and soul!